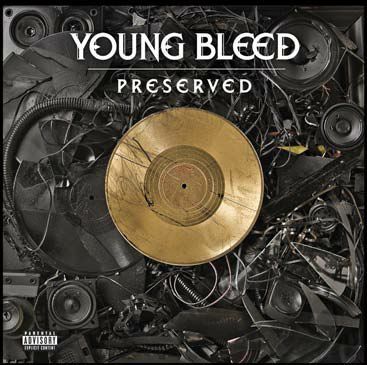 With Preserved available in stores and online, Young Bleed is experiencing a deja vu moment in his career. Where as he was once an underrated talent making his debut on an independent powerhouse of a label with his album My Balls And My Word with No Limit Records, he finds himself in the same position with Preserved, his debut under Strange Lane. We asked Young Bleed what the title of the album means and what he is bringing to the table with his place in a new roster. The name of the album is Preserved. What does that mean? Something old and something new. I’m from an older time, as far as industry-wise. The world look at me like in the 90s, but everyone else a 70s baby, an 80s baby. A lot of those different things you hear today you have the same old rudiments as far as hip hop from the East Coast to the West Coast. By the time it reaches the South–it’s a gumbo thing down here so we try to mix it all together and try to come up with the best case scenario to make dollars and cents at the end of the day. So, Preserved is me re-introducing myself and reinventing myself. I was kept kind of hidden, like a diamond in the rough. Some people know about me but not everyone got a chance. That came and went as far as mainstream and back to this underground and independence. I’m trying to rekindle the best of both worlds. Now that you’re signed to Strange Lane, how are you feeling right now? New birth! It’s a pleasure to be working with Dave [Weiner] again, of course. Dave was a guy that worked beyond his means to make sure I was in the right hands and the right position the best he could at Priority at the time. At the same time I’m a fan of Tech. I’ve been listening to him since Gang Related. I had a chance to meet and talk with Travis. We talked over the phone and everyone was open to it–I was open to it and we all felt like it was a good thing. It’s like day one all over again for me! Just like in the beginning–I’m trying to pick up that same excitement and same enthusiasm as it was back then. What has the fan response been like upon you being signed to Strange? I’m getting 90/10 percent. You got 10 percent of the haters with a little hate mail here and there, however, the majority, and this might be newcomers–everybody’s open to it. More so in the South too because I haven’t put out a record in awhile. I feel like I’m the bridge between young and old so I feel everybody’s open to it. With having such a big record like “How Ya’ Do Dat’ There” years ago, that was a really big record. I’ve got people from Australia to back here waiting to see what I do next. What do you think you’re going to bring to the camp here? I’m about the unity in the community. I’m trying to put a bridge between any gap between blood and cuz. I want to get between that gap. I want to get to more reality based rap. We can get as lyrical as we wanna go or go as gangsta as we wanna go. The reality that this is hip hop music–we can all kill or do whatever in the street–but when it come to this thing here, at the end of the day we’re all trying to make money and make a living. I want to touch on those reality points of life and death, and how fast and how short it is, and aint no man above the crew and so forth. I want to bring it back to a ground level and fill that void that I feel like the whole world, and not Strange in particular, I don’t feel like they’re missing that to some degree, but I go to the clubs out here and it’s a different thing in the south. I listen for who’s records are playing in the clubs and right now I’m not hearing Tech and Lynch and I’m fans of all of their music. I listen to them around the house and ride to them and so on and so forth. I see something is missing around this area and that people aren’t in tune to what’s happening up there. Really I’m just trying to capture all three coasts and everything in between. Those type of things I feel like I have the potential to fill those voids. I’m adding to what may be missing as opposed to versus coming in and taking a way or trying to do too much. Click here to purchase Preserved on iTunes.